If you like to enjoy your tea as soon as you brew it, then consider making a shift to a brand new tea kettle. The problem with some of the popular tea kettles out in the market is that the temperature of the final brew is too hot. So the common response of many tea and coffee drinkers is to let the cup sit for a one or two minutes before enjoying the freshly brewed drink. But this time, with the development of new versions of kettle you can safely prepare your tea to your exact temperature specifications. The appropriate targeting of brew temperature is made possible by the variable temperature kettle, another innovation in the growing list of tea kettles in the market. By using this kettle, you can target a specific temperature for your next cup of tea. If you want your tea a few degrees below boiling point, then you can get it with this product. The great thing about this kettle is that there will be a specified number of pre-set settings. Some brands will offer 5 pre-set settings to accommodate different types of tea leaves, from green tea (175 F) to black tea (212 F). Through the targeting of the recommended brewing temperature, you can enjoy the perfect taste profile for the specific type of tea. The introduction of this type of tea kettle has improved the list of options available for first-time shoppers of tea kettles. The life of the tea lovers in search for that perfect cup of tea has been made easier, thanks to this advanced feature. But with these benefits come the usual problems. Since the list of options is growing, first-time shoppers will now find it hard to select what is the best teapot. Aside from this modern take on the tea kettle, there are traditional options too that include the traditional whistling kettle, the stovetop type and the electric tea kettles. 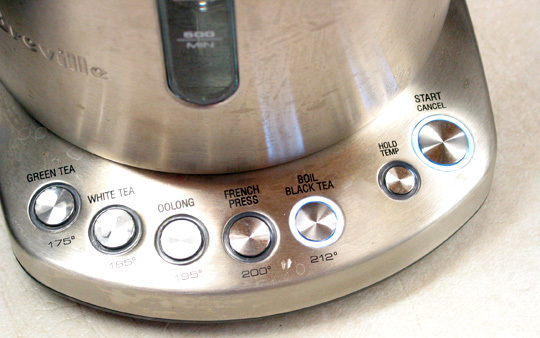 Each type of kettle also comes with its own set of features, thus making the selection more difficult and confusing. If you are still clueless on what to buy, then consider your personal taste and preferences. If you just want your regular afternoon tea, then the traditional teapot is best for you. If you want to approximate the real thing and you want to get an authentic tea experience, then the variable temperature type is best. Want To Know Where To Buy A Teapot? How About Online? Once you have made your selection, then that’s the time you can shop for one. There are different ways of shopping for your teapots, and surely you will ask where to buy a teapot. Your best bet is to go online for your selected teapot or kettle, whether you go for the whistling kettle or the variable temperature kettle. Just make sure you read product reviews to get the best deals. Find A Great Deal On Your Variable Temperature Kettle Right Now!